Awakening This one is January’s page… still a work in progress. I just want to finish the other brown butterfly and the left blue spiral. This page is about new beginnings. January is a big month for goal setting and resolutions. Butterflies are a great symbol of rebirth. Spirals are a symbol of life. So this page is about making a commitment to myself to continue in my self-improvement and fitness. I haven’t written my paragraph for this one quite yet. But it will be something similar to December's. This one also still needs to have a backing finishing, after the beading is done. 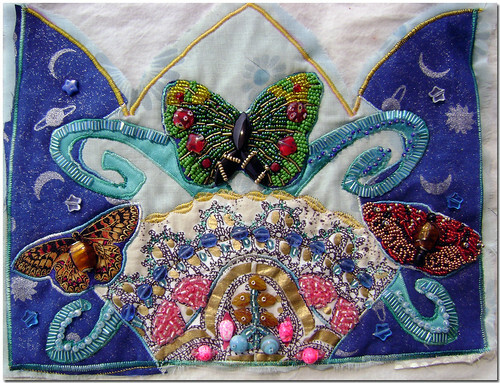 The Beaded Journal Project is a year long challenge that asks participants to create a fabric journal page for each month that captures the experience of that month, for the artist. We began this journey in September 2008. I chose to create a shrine style page with the concept of a sculptural book that would both stand and have doors that opened onto the beaded pages. The project has gone through different phases of development and is not yet complete. Finishing a project of this nature (hiding the stitching, making all surfaces presentable) is turning out to be a challenge. This is the first time I have done beaded artwork on this level. I am excited about what I have learned so far. This is the 5th page in the series. Each shrine page will close with a tied ribbon and the back will have a written statement about the piece. Each piece is machine quilted using a variety of printed, batik, and hand-painted fabrics, then embellished with ribbon, lace, trim and beads. The beads are glass beads in many sizes, shapes and types.